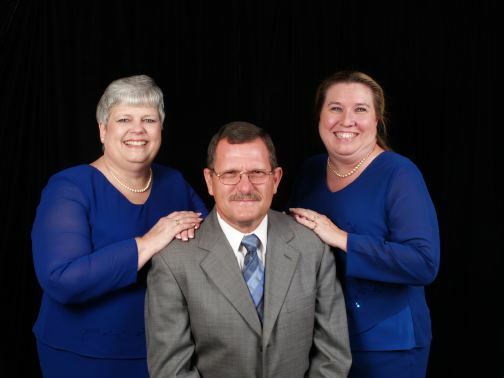 We are Canaan Bound, a southern gospel music trio, singing for our Lord. We are from Denison, Texas, a small town 75 miles north of Dallas on the Texas and Oklahoma border. After being friends for many years and singing together periodically in our local church, God laid it upon our hearts to create Canaan Bound and start spreading God's Word through song. Our prayer has been that God would open and shut doors according to His will. God has not just opened doors but has flung them wide open, and we praise God for that. We are overwhelmed at the opportunities God has sent our way. We all love God, and we have each placed him first in our lives. Any accomplishments we might obtain we give Him all the glory. Dale and Sue Kennington have been married over thirty years and have thoroughly enjoyed singing and ministering through their local church. Sue began singing at the age of 8. Her mother and grandmother were the ones who inspired and encouraged her to develop her musical talent. Dale played the trumpet throughout junior and senior high schools, as well as singing with his family on occasion. Shortly after they were married they began singing together -- a blessing they have enjoyed sharing together. Ruth Ledbetter is a very gifted and talented person in singing and playing the piano. She has sang since a child and then toured with a group called Sonshine, Inc. while attending Mt. Vernon Nazarene College. She has a rich heritage in gospel music. Her mother sang with Bill and Gloria Gaither when they first started singing. We would love the opportunity to share God's Word through song with you, your church, or your organization. We can be available for monthly singings, revivals, and special services. We hope you will pray for us as we journey down this road God is directing us down.